FRESNO, Calif. (KFSN) -- Some Valley businesses had their names pulled out of a spinning barrel for the right to sell liquor at their establishments. The California Department of Alcoholic Beverage Control (ABC.) held a priority license drawing on Tuesday. Some applicants were in attendance for the drawing that was held to determine who has priority for six available off-sale general licenses in Fresno County. The District Office received 40 applications for those six available licenses which is the reason the drawing was held. ABC put the names of the applicants in capsules and placed them inside a spinning cage. The department then had an outside third party individual pull the capsules one by one from the cage to determine who gets priority. 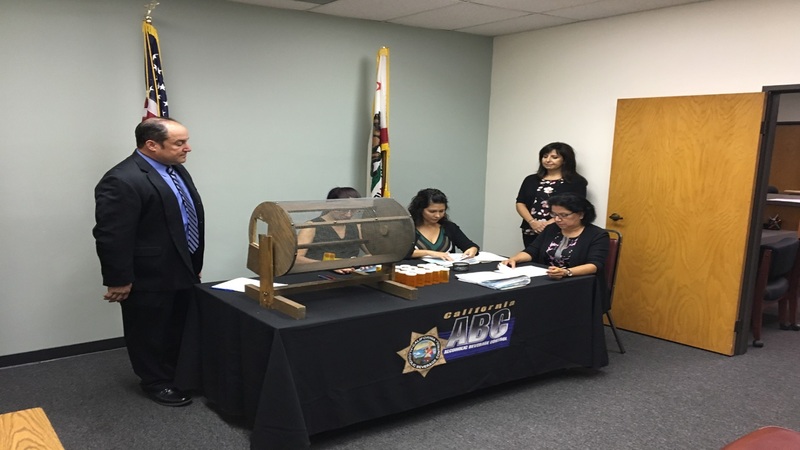 A drawing was also held for two available off-sale general licenses in Tulare County. The District received 25 applications for those two licenses. 1. La Fiesta Market Inc.
5. Selma El Mercado & Discount Center, INC.
1. GH Food Mart Inc.
ABC will hold priority drawings whenever there are new original licenses available and those are determined by population figures. One new off-sale license becomes available for each 2,500 new residents within a county. Census figures become available each year to determine if new licenses are available in California.